Habit: Annual to perennial herb, hairs simple; base woody or not. Stem: ascending to erect, leafy or not. Leaf: basal rosetted or not, pinnately lobed or toothed, petioled; cauline 0 or entire to lobed, petioled or sessile. Inflorescence: elongated. Flower: sepals ascending to spreading, base of lateral pair not sac-like; petals +- obovate, yellow [violet or white]. Fruit: silique, dehiscent, segmented, generally narrowed between seeds, linear, cylindric to +- flat parallel to septum, stalked above receptacle or sessile; valves 1-veined, glabrous; terminal segment seedless [seeded]; stigma 2-lobed. Seed: 20--46, in 2 rows. Species In Genus: 25--30 species: Europe, northern Africa, western Asia. Etymology: (Greek: 2-rowed, from seed arrangement) Note: Diplotaxis erucoides (L.) DC. occasional weed in botanic gardens. Habit: Generally glabrous above. Stem: 2--7(10) dm, generally woody at base. Leaf: basal not rosetted, deeply pinnately lobed, lateral lobes 2--5; cauline short-petioled. Flower: sepals 4--6 mm, glabrous or hairs few; petals 7--11(13) mm, 5--8 mm wide. 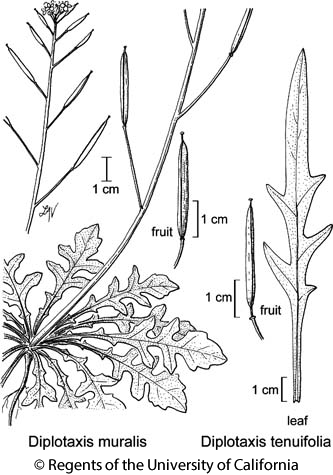 Fruit: 2--5 cm, 1.5--2.5 mm wide; pedicel 8--35 mm. Seed: 20--32(46), 1--1.3 mm, ovoid. Chromosomes: 2n=22. Citation for this treatment: Ihsan A. Al-Shehbaz 2012, Diplotaxis tenuifolia, in Jepson Flora Project (eds.) Jepson eFlora, http://ucjeps.berkeley.edu/eflora/eflora_display.php?tid=23133, accessed on April 23, 2019. No expert verified images found for Diplotaxis tenuifolia. ScV, SCo; Markers link to CCH specimen records. Yellow markers indicate records that may provide evidence for eFlora range revision or may have georeferencing or identification issues. Purple markers indicate specimens collected from a garden, greenhouse, or other non-wild location.